A short summary on Single Pulse Transcranial Magnetic Stimulation to treat migraine. Home > Stop the attack > Fed up of pills? Here is a short summary on Single Pulse Transcranial Magnetic Stimulation to treat migraine. These days, there is a pill for everything, and as many patients soon discover, there is often more than onepill for everything. While pharmacology remains a cornerstone of modern medicine, no therapeutic option is perfect. Many patients are often left feeling as if they’re making a deal with the devil; trading the chance at some desirable benefit for the risk of incurring potentially serious side effects. Some patients are medication-phobic – and that’s okay! Our job is to provide you with all potentially beneficial options. Neuromodulation options were reviewed during the recent American Headache Society Meeting, Doctor Amal Starling, MD, FAHS, and Assistant Professor of Neurology at the Mayo Clinic. She focused on Single pulse transcranial magnetic stimulator (sTMS). sTMS is now FDA approved for the acute and preventive treatment of migraine in adults. The device targets the cortex, the outer part of the brain, using strong magnetic fields that induce a local electrical current. This has been shown in studies to Inhibit cortical spreading depression, the phenomenon thought to be the underpinning of migraine aura, and is thought to modulate cortico-thalamic projections, thereby reducing excitability of trigeminothalamic pathway. Too much medical jargon? the electromagnetic pulses make their way to the surface of your brain and change the way that your pain network functions. sTMS can be used both as prevention: (4 pulses twice a day), or as an acute abortive (3 pulses as needed). The study, funded by eNeura, showed a −2.8 ± 0.4 mean reduction of headache days from baseline (9.1 days), which was statistically significant compared to the placebo arm. No serious device-related adverse events occurred during studies, however some people experienced light-headedness, dizziness, tingling, ringing in the ears, or the occasional headache. People who have seizures or conductive materials/implants in the head, neck, or upper body should not use this treatment. The cost is $750 USD every 3 months as part of a subscription service. This is currently available only in the USA, however there are plans to expand to Canadian markets eventually. 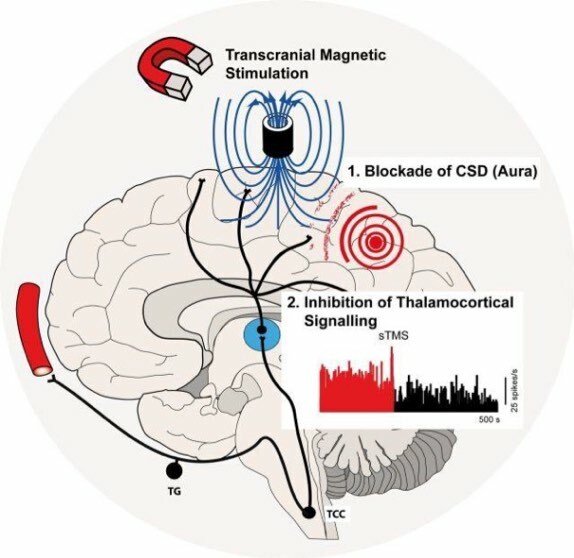 Transcranial magnetic stimulation and potential cortical and trigeminothalamic mechanisms in migraine. Anna P. Andreou Philip R. Holland Simon Akerman Oliver Summ Joe Fredrick Peter J. Goadsby. Brain, Volume 139, Issue 7, 1 July 2016, Pages 2002–2014. Additionally I would also like to know when AJOVY will be available here in Canada? And when these CGRP drugs will be covered like other medications here for example Botox? I prefer Alternative Med than that pharma pills, Did you guys ever try using medicinal marijuana for severe headache or migraine? They said that medical cannabis is very effective when it comes to anxiety, migraine, and insomnia. At first, I was doubtful so I started doing my own research and read articles about marijuana. I found out that each marijuana strain has different uses for different diseases. check this https://www.gyo.green/crockett-family-farms-crockett-s-sour-tangie-cff-sot-r.html. This one is very effective when it comes to stress, migraine, and insomnia. I have 0% experience using cannabis so I’m hoping some of you guys can enlighten me and give me more information about this. Thanks!